DALI Rubicon 2 review | What Hi-Fi? The new Rubicon range sits just below the company’s high-end Epicon line of loudspeakers. The 2s, the second rung on the Rubicon ladder, use the same 29mm soft-dome tweeter found in the Epicon and also feature Dali’s trademark SMC (Soft Magnetic Compound) magnet system designed to reduce distortion. Dali doesn’t seem to know how to make an ugly speaker. The company’s budget offerings always look and feel beautifully made, and at this price the Rubicons go to another level. They’re available in four finishes: high-gloss black, high-gloss white, Rosso and Walnut. Each cabinet boasts a subtle curve both front and back, which adds to their elegant appearance. The rear is punctuated by a bass port and chunky speaker terminals. Round the front you can see the soft-dome tweeter above a 16.5cm wood-fibre driver. Positioning the Dalis requires a little care. You’re not going to want the Rubicon 2s hugging a rear wall – the positioning of the ports means bass does get boomy, especially at high volumes, but as long as they’re given around 30cm or more breathing space you’ll be fine. 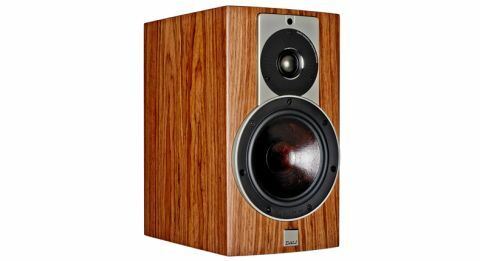 As with all Dali speakers, the Rubicons have been designed with wide dispersion of sound in mind. There’s no need to toe them in, as the dispersion comes with excellent stereo imaging as part of the package. Play Nina Simone’s I Put A Spell On You and every element hangs beautifully, the piano and double bass just right of centre with percussion floating just above. Simone’s expressive and emotive vocal blends warmly and then the sax kicks in, punctuating the relative calm with its natural rawness of tone. The Rubicons really paint a vivid, involving picture. The speakers are as happy floating along to Nina as they are rampaging along to the track Mombasa, taken from the Inception soundtrack. Here the Dali’s hit with force. There’s plenty of bass weight – providing you take care with positioning relative to the rear wall. The trick is to keep those taut, precise edges. We notice the Rubicons flex more muscle and sound more robust when you crank up the volume, although they’re hardly limp or lacklustre at low levels. But it’s the pace and dexterity of the Dalis that really makes you sit up and take notice. There’s real agility and nimbleness to the sound that makes long-standing favourites, such as the £1200 ATC SCM 11s, sound a tad ponderous and wallowing. The Dalis never miss a beat to Lady Gaga’s Starstruck and they inject so much pace and tension into Why Do We Fall? from The Dark Knight Rises OST you’re moved to the edge of your seat despite the fact you can’t see the film. There are dynamics, scale and authority in abundance. The Dali Rubicon 2s are quite the standmounter. They’re an expressive and enthusiastic listen with little to fault. If you hadn’t guessed, we’re big fans.